Cryogenics is the study and use of materials at extremely low temperatures. Such low temperatures cause changes in the physical properties of materials that allow them to be used in unusual engineering, industrial, and medical applications. For example, in the cryogenic temperature range, air becomes a liquid—or even a solid—and living tissue freezes instantly. Matter behaves strangely at the lowest temperatures of the cryogenic range. Electric currents never stop flowing, liquids run uphill, and rubber becomes as brittle as glass. In medicine, cryogenic cooling is used in some diagnostic techniques, such as magnetic resonance imaging (MRI). Cryosurgery uses liquid nitrogen to kill unhealthy tissue by freezing it. Cryogenics is expected to play an important role in the development of better procedures for preserving human organs for transplant. British chemists Michael Faraday (1791-1867) and Sir Humphry Davy (1778-1829) did pioneering work in low-temperature physics that led to the development of cryogenics. In the early to middle 1800s they were able to produce gases by heating mixtures at one end of a sealed tube in the shape of an inverted "V." A salt and ice mixture was used to cool the other end of the tube. This combination of reduced temperature and increased pressure caused the gas that was produced to liquefy (turn to a liguid). When they opened the tube, the liquid quickly evaporated and cooled to its normal boiling point. In 1877, French mining engineer Louis Paul Cailletet announced that he had liquefied oxygen and nitrogen. Cailletet was able to produce only a few droplets of these liquefied gases, however. In his research with oxygen, Cailletet collected the oxygen in a sturdy container and cooled it by evaporating (drying up) sulphur dioxide in contact with the container. He then compressed the oxygen as much as possible with his equipment. Next he reduced the pressure suddenly, causing the oxygen to expand. The sudden cooling that resulted caused a few drops of liquid oxygen to form. The need for a way to store liquefied gases led to another important development in cryogenics. In 1891 Scottish chemist James Dewar (1842-1923) inroduced the container known today as the "Dewar flask." The Dewar flask is actually two flasks, one within the other, separated by an evacuated space (a vacuum). The inside of the outer flask and the outside of the inner flask are coated with silver. The vacuum and the silvered sides of the container are designed to prevent heat passage. Dewar was also the first person to liquefy hydrogen in 1898. In 1908 Dutch physicist Heike Kamerlingh Onnes (1853-1926; 1913 Nobel Prize winner for physics) liquefied the most difficult gas of all, helium. He liquefied it at the lowest temperature ever achieved in a laboratory to that date, 4.2 kelvins (the kelvin measurement is a scale of temperatures measured in degrees Celcius from absolute zero). This marked a significant milestone in the history of cryogenics. Since that achievement, increased attention has been devoted to the study of physical phenomena of substances at very low temperatures. A substance is normally cooled by placing it next to something colder. To make the substance supercold, however, heat must also be removed and the substance must be insulated (encased). An important method of cryogenic supercooling involves liquefying gases and using these gases to cool other substances. One technique is to convert to liquid form a gas that can be liquefied by pressure alone. Then a gas requiring a lower temperature to become a liquid is placed in a container and immersed (dipped) in the first. The gas that is already liquefied cools the second and converts it to a liquid. After several repetitions of this process, the targeted gas is liquefied. A Dewar flask is normally used to store such very low temperature liquefied gases. Doctors prepare a patient for cryogenic surgery. (order). The energy the ions use to move comes from the heat energy of the substance, which causes the temperature of the substance to drop. Liquid nitrogen is one of the safest cooling agents available. In medicine it is used to kill unhealthy tissues by freezing them. Cryogenic processes are also used to supply "banks" storing eye corneas, blood, and sperm for future surgical procedures. Some embryos have also been frozen and stored for later implantation (surgical placement) in women. 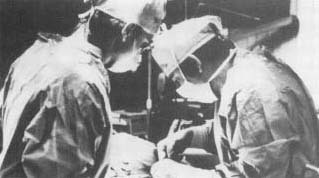 In 1961 American surgeon Irving S. Cooper introduced a freezing technique called cryosurgery. Cryosurgery is relatively bloodless because the low temperatures used constrict the blood vessels, stemming the flow. Special instruments are used that have freezing tips to kill the damaged tissue and shields to protect surrounding tissue. Cooper used cryosurgery to freeze and destroy damaged tissue in the brains of patients with Parkinson's disease (a degenerative illness). Since then, cryosurgery has found many applications. It is used to repair detached retinas and to remove cataracts. It is also used to treat liver cancer and prostate cancer. Cryosurgery is also widely used in the fields of dermatology, gynecology, plastic surgery, orthopedics, and podiatry. Cryosurgery has also been used successfully for more than 30 years in veterinary medicine. I believe that this was an article that was very informational.I am doing research about thistopic for science class I would acually like to know a little more about this and the temperture such as in Farienhieght and in Celsius. For the unit that I am learning in science. I found some of the information in this article helpful. I am writing a research paper for a college class. My topic is Cryogenics and the Wood frog.